Explore the beauty of Mexico City, from Colonial times till today. Here’s a quick guide to Mexico City, Mexico, one of the world’s largest cities, where interesting museums, parks, monuments and culture await the family. The Mexica, a branch of the Aztec people, founded Mexico City nearly 700 years ago. At that time, the city’s name was Tenochtitlan. According to legend, the settlers associated the city’s establishment with a vision of an eagle biting a serpent (visible on the Mexican flag today). Several centuries of dramatic political, social, and religious history later, Mexico City is a bustling world capital with an array of cultural gems, archeological treasures, and kid-friendly diversions. Keep in mind its high altitude, which may cause some discomfort, and the high pollution levels, which increase in the hot weather. Mexican families often travel together, so expect your tourist experience to reflect this cultural emphasis. It’s a wonderful destination to share with children, but plan your days carefully – this city is huge! You’ll find our recommended attractions listed by neighborhood to make your sightseeing days easier; almost all are worth exploring for all ages. The Zocalo or main square is the city’s traditional heart, within the 680-block area known as the Centro HistÃ³rico, a designated UNESCO World Heritage Site. It is a great starting point for exploration by families interested in history, culture and the ‘old’ Mexico City. At 640,000-square-feet, the colorful Zacalo is the third largest public square in the world after Tiananmen Square in Beijing and Moscow’s Red Square. Catedral Metropolitana, the largest cathedral in Latin America, resides over the North side of the square. 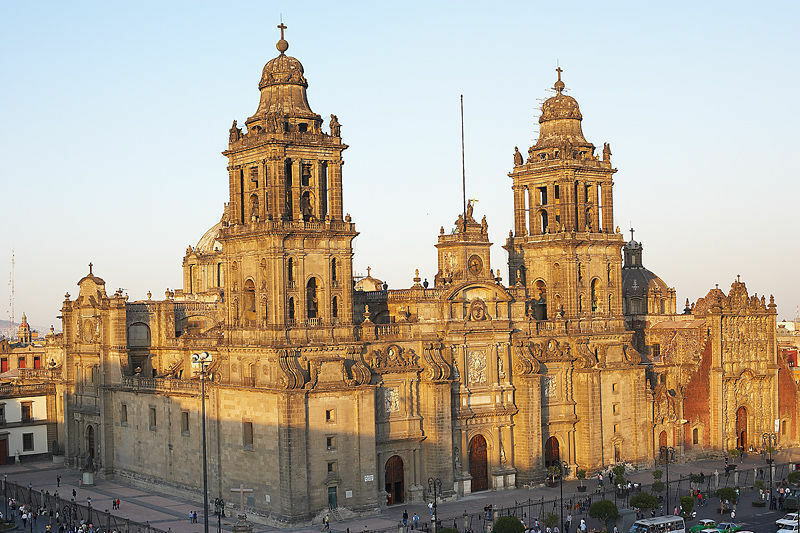 Construction began in 1567 with the rubble of Aztec buildings, and was completed 250 years later with a melding of Gothic, Baroque, and neoclassical styles. Try to visit after 8pm, when a local group of devotees teaches Aztec dancing in the plaza in front. Museo del Tempo Mayor (Great Temple) is located northeast of the Cathedral. One of Mexico’s most historic cultural attractions, it was uncovered by archeologists in the center of old Mexico City, and is believed to be the site of the capital of the Aztec Empire known as Tenochtitlan. The 8th century AD site, within a five minute walk of the colorful Zocalo, consists of a large stone pyramid base and remains of religious housing surrounding what was the Aztec’s most sacred place. Their position indicates that most of the buildings in the city center, if excavated, would reveal a wealth of Aztec ruins beneath them. The permanent exhibit is fun for families with younger children, as there are many large carved pieces that were excavated from the site. Also off the main entrance is a wall of skulls with unique personalities, carved in sandstone and lined up in chilling rows. Palacio Nacional stands on the East side of the Zacalo. The main reason to visit here is to view Diego Rivera’s famous murals adorning the stairwell. Rivera led Mexico’s fresco painting revival in the first half of the 20th century and was married to Frida Kahlo, another celebrated artist. Over a period of 20 years, he painted 4,850-square feet of the Palacio Nacional, depicting Mexican history from Pre-Conquest (by Spain) until after the revolution. The imposingly beautiful Museo del Palacio de Bellas Artes houses one of the country’s most significant fine arts collections, and is well worth even a brief visit. All ages will be stunned by its gilt, art deco ornamentation, acres of marble and, of course, display of paintings. Even those with little tolerance for art will appreciate a snack at the Cafe Terrace and a view of the stained-glass curtain designed by Tiffany, depicting the Valley of Mexico that decorates the theatre. Don’t miss the twice weekly performances of Ballet Folklorico (5255/5529-9320), if you have time. Choreographed by the noted Amalia Hernandez, this musical features the traditional folk dances of each region performed in traditional costumes to wonderful, authentic live music. Not far away is M.I.D.E. (Museo Interactivo de Economia) at Tacuba 17, a state-of-the-art multimedia facility in the former Convent of the Bethlemites. Mexico’s Museum of the Economy is dedicated to explaining the meaning of money. Although exhibits, videos and labeling are largely in Spanish, displays such as the comparative photo murals depicting what one family in each of the world’s regions eats in one week are universally appealing and informative. Shopping: There are plenty of markets in Mexico City, but the Mercado de la Merced, open daily, tops them all. The energy level is intense in this vast warehouse complex selling mainly fruits, vegetables, and discount housewares, about seven blocks from the Zacalo. La Ciudadela is another market offering a great assortment of handicrafts. Fonart is a popular folk arts shop. This boulevard is the major tourist corridor and Mexico City’s answer to Paris’ Champs ElysÃ©es. Modern office buildings, luxury hotels, outdoor cafes, colonial mansions, bronze statues and art exhibits line 10 lanes of traffic as Paseo cuts through several colonia or neighborhoods. Watch for newly restored statues of CuauhtÃ©moc (last emperor of the Aztecs), Christopher Columbus, and El Angel (a golden winged victory) at the major intersections. Zona Rosa, to the south, has been the destination for designer boutique shopping, restaurants, and nightlife. The traffic roundabout at El Angel marks the start of this upscale, European style neighborhood. Both the Bazaar de Antiguedades for antiques, and the Mercado Insurgentes for handicrafts also lure shoppers to the area. Two newer districts, Condesa and Roma, are south of the Zona Rosa and packed with the young and the brave, gallery-hoppers and a look at the city’s future. Roma in particular is a fun destination with your teens. If you’re intent on European designer clothing (and we wouldn’t be), head even farther south to the new Santa Fe neighborhood built around the convention center. To the South is San Angel, site of the celebrated Bazaar Sabado, held Saturdays only (10am to 7pm year round). Although all the small streets around the neighborhood’s central Plaza San Jacinto are packed with fruit and toy vendors, locals come for the indoor arcade of upscale galleries that feature artisans making jewelry, tiny plaster Day of the Dead figurines, embroidery, painting, copper pots, and other wares. Chapultepec Park (Bosque de Chapultepec) was once a hunting reserve for Aztec nobles and is now the largest park within a city in the world. It is located at Col. San Miguel Chapultepec, with entrances along the major avenues of Reforma, Chapultepec and Constituyentes. Irrigation water and resources are scarce, so the park grounds are not as lush as they used to be, but this cultural center is scattered with interesting attractions for families and there’s always something new to see. The Chapultepec Castle, an 18th-century residence of Emperor Maximilian, now houses the National Museum of History and next door, the Gallery of National History. We say save the kids’ attention spans for the Archaeological Museum (see below). Ask your hotel concierge for the current schedule of free performances (might be Aztec pole dancers, “Swan Lake” ballet outdoors in winter, costumed acrobats) and current opening hours of attractions. If traveling with teens, call 5207-2611 to inquire about Segway Tours of the park. Museo Nacional de Antropologia is considered by many to be Mexico City’s premier attraction and one of the world’s most important museums. Outside, the 18-foot monolith of Tlaloc foretells the extensive Mexican history that awaits inside. The first floor houses an impressive collection of artifacts from Mexico’s pre-conquest civilizations. The highlight is the massive Aztec Calendar Stone, which displays a dramatic vision of the cosmos. Ethnographic rooms upstairs explore the “living history” of daily life in indigenous communities. English, French, Spanish language tours and guidebooks are available. Closed Monday, the museum is located at Avenida Paseo de la Reforma, Col. Chapultepec Polanco, Miguel Hidalgo District. Museo de Arte Moderno is also within the park; the main building features a large, permanent collection of Mexican painters and foreign artists influenced by Mexico. Works by Frida Kahlo and Diego Rivera are there, along with other important artists of the modern movement. The smaller surrounding buildings display temporary, international exhibits. Closed Monday, the museum is located off Avenida Paseo de la Reforma, at Gandhi Street in Chapultepec Park, Miguel Hidalgo District. Papalote Museo Del NiÃ±o, also in Chapultepec Park, is a modern children’s museum which belongs in a class by itself. Mexico’s first interactive educational facility, it is a superb prototype for other children’s museums around the world. Kids 14 and under will appreciate this expansive, hands-on facility, which makes up for every “Don’t Touch” sign they’ve ever seen. More than 350 of state-of-the-art exhibits include a musical staircase, climbing treehouse, a nightmare disposal machine, and a wheelchair obstacle course to help children learn about disabilities. There’s also a Megapantalla or IMAX theater showing four different movies daily. Everyone, from infants to teens to adults supervising them, will find something of interest. Chapultepec Park Zoo (Zoologico Chapultepec), recently renovated, is best known as the first zoo to successfully breed Pandas in captivity. Visitors can see them as well as 220 other species of animals within this quiet, 42-acre zone. There’s an aviary, a miniature railroad, and a children’s “hand-on” section for some close creature encounters with baby elephants, lions and others. Closed Monday. Also located within the park’s huge precinct is La Feria, a small and popular amusement park with the charm of a traditional midway, and the Atlantis Marine Park, which features an aquarium and trained marine life shows. This shrine at the northern city limits is notable as the most currently hallowed spot in Mexico. According to legend, a man saw a vision of the Virgin Mary here in 1531. The second time he saw the vision, it was emblazoned on his cloak. A church was built on the spot, but the continuous throng of visitors (now numbering 14 million per year) caused a newer one to be built. The cloak hangs over the altar in this more contemporary church, and there’s also a museum on the premises. The floating gardens of suburban Xochimilco are another UNESCO World Heritage site and a pre-Hispanic marvel. The Aztecs built chinampas (gardens) on a lake by anchoring them to the shallow sides; these gardens eventually filled into islands, which don’t actually float, amidst a series of canals. Today, Xochimilco is the most popular Sunday outing for many Mexicans and there’s sure to be fun in the air during a weekend visit. There are miles of canals to boat on, and plenty of floating vendors selling flowers, fruit, tortillas, and even boat-side serenades. There’s also a Visitors Center and Botanic Gardens. Located in a suburb about an hour’s tour bus drive (31 miles northeast) from downtown MÃ©xico City, these remarkable ruins recall a city first occupied around 500 BC and at its zenith around 500 AD. Not much is known about the inhabitants of this ancient city, but artifacts from recent digs are on display in the site’s three museums. As for TeotihuacÃ¡n itself, there are fascinating remnants of the Temple of Quetzalcoatl, Avenue of the Dead, and the celebrated Pyramids of the Sun and Moon. Open daily; archeology buffs, need we say more? Though it’s not exactly the most “Mexican” of attractions here, we’ve got to admit that kids (and Mexican families) love theme parks. This south of the border Six Flags, a major renovation of an older amusement park, is located at 1500 Carretera Picacho-Ajusco, Colonia Heroes de Padierna, Mexico, D.F. 14200 at the southern edge of the capital. The main thrill rides, like those at the parks in the United States, are the Medusa and Batman coasters. Younger children will especially love the Looney Tunes section, dolphin shows and open-air theater. Also, Six Flags is welcoming a new attraction to their park called the Dolphinarium by Dolphin Discovery, in which you and your family actually have the opportunity to swim with these darling water creatures. The Dolphinarium features eight dolphins and five sea lions that take part in a variety of interactive programs and educational presentations. Closed Monday; check website for seasonal schedule. The innovative City of Children is in the Santa Fe shopping mall, Vasco de Quiroga 3800, Antigua Mina la Totolapa, Mexico, D.F. 05109 in the southwest part of the city. Similar to other play-work spaces that have opened in major malls to encourage parental shopping while kids are kept busy, this is a remarkably energetic place. Kids can line up in the bank to make change for patrons, check out the fire station, or drive a bus. Activities are well spaced wtih plenty of seating space for parents and grandparents; it’s definitely worth a visit if you’re in this part of town. There’s a cute “farm” setting for ages 1 to 3, and more than 60 other pursuits for kids up to age 16 (though we bet most teens would prefer to shop.) Children ages 8 and older can just be dropped off by parents, but younger children must be monitored from a parents’ lounge. Open daily year round.